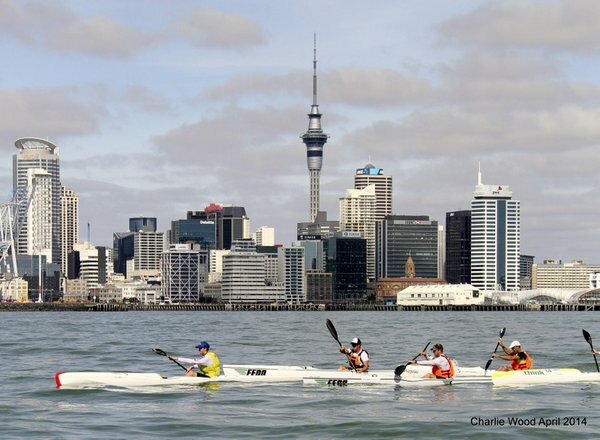 Oily flat, steamy, hot conditions greeted the 95 competitors, lining up pensively off Birkenhead Wharf, Auckland. The tide would be turning nose-on shortly, and the 1 knot south westerly breezes would make it feel like we were paddling in a vaccum. The 24km stretch to Waiheke Island's Matiatia Bay was going to be one of my longer recorded times, ever, even though I paddle this stretch of water weekly! Dawid Mocke (current Worldseries no. 2) was hemmed in on the left, and Cory Hill (current Worldseries no. 3) and Mark 'Ando' Andersson were on the favoured extreme right, as the armada began the slow drifting across the imaginary start line anticipating Darcy Price's "Get set.... GO!" 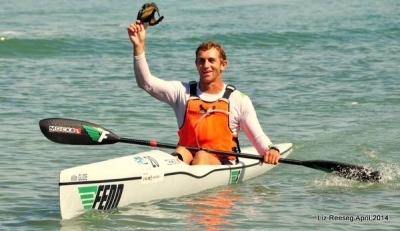 The premier surfski event of New Zealand is also the New Zealand Canoe Racing Ocean Ski Champs, this year attracting 18 international paddlers from Australia, Brazil, Germany, Russian Federation, South Africa. The ladies race was going to be a battle of tenacity, with Rachel Clark (last years Queen Of The Harbour) on form for Molokai, Teneale Hatton training hard but committed to the NZ ladies K4 team, 'Evergreen-Dene' Simpson, young up and coming star Rebecca Cole, Aussie Tracey Wilson, and Maria Plyashechko from the Melbourne-based Russian Federation all aiming for a spot on the podium. With the SUP's and Double Ski's a few minutes ahead, the confused harbour waters were whipped to a frenzy as the swarm of ski paddlers charged towards the 1st upright stancheon of the Auckland Harbour Bridge, staying well right of the rusted metal and twisted concrete fouled waters on the left, where both Dawid and I had damaged our rudders in days leading into the race searching for a clear passage on a variety of tides. Mocke, a former King Of The Harbour had done his homework, and favoured a left hand line heading past North Head. With the front-pack doing 16km/h pace in the infamous chop, he darted off to the left on some tiny, almost impercievable runners just before the navy base. Cory, Ando, 18 year old Kenny Rice (younger brother of Fish Hoek's 'Shaun the Prawn' Rice), myself, the two Tahitians, Leopold Tepa and Hiromana Flores, and local North Shore paddler Brendon 'Doon' Davies had to reform or chase. I saw Cory and Ando looking over their right shoulders at the stream of yachts and pleasure craft exiting the harbour over to the right, and they broke off, heading hard right to take advantage of this boat wash.
Dawid quickly put up a growing lead, but the Aussies Cory and Ando, working together with the aid of the last of the centre-channel currents, started to close up. Up ahead I saw Dawid looking over his shoulder from his extreme left hand course, closest to Rangitoto Island, with its textbook volcanic skyline, and make a set a direct course towards the centre of the channel. "I was watching the speed dropping on my Garmin, and when this got below 13 km/h I knew I was out of the main current. I looked over my shoulder, saw Cory hunting me down, and I made a conscious course change to get back into the running current, the first of a few conscious course changes!". In a perhaps unexpected twist, the womans race unfolded with the same top three result as last year. Rachel Clarke took out the womens race in fine form, securing the Queen Of the Harbour title. Silver went to young Becs Cole, and former Olympian and evergreen Dene Simpson took the bronze, with Teneale Hatton using the race as a training session, refusing to comprimise on her K4 team training the same morning. Full report thanks to Garth Spencer.